Not all lasagne are treated equal. Packed with roasted harvest vegetables, this easy skillet lasagna recipe houses plenty of garlic and cheese flavor. Harvest vegetables are the main feature of this skillet lasagna recipe. The flavor and texture of roasted butternut squash and parsnips are highlighted by al dente lasagna sheets and baked to perfection along with ricotta and Parmigiano-Reggiano cheeses. Topped off with Barilla's garlic pasta sauce, this skillet lasagna may seem like it can only be enjoyed during the harvest season, but in reality, comfort food tastes great year round! Who said you needed a baking sheet to create a great vegetable lasagna? In a deep 12-inch skillet, heat oil in oven for 5 minutes. Add squash, parsnips, and salt, and toss to coat; return to oven. Roast about 25 minutes or until tender, stirring once halfway through. Meanwhile, in a large pot, bring 4 to 6 quarts of water to a rolling boil; add salt to taste and the lasagna sheets; stir gently. Cook according to package directions; remove from heat and drain well, reserving 1 cup pasta water. Remove vegetable skillet from the oven. Stir in the lasagna sheets and garlic tomato sauce. Stir in just enough of the reserved water to moisten. Top with dollops of ricotta cheese, and sprinkle with mozzarella and ¼ cup Parmigiano-Reggiano. Place in the oven for 10 minutes to heat through. To serve, sprinkle with additional Parmigiano-Reggiano cheese. 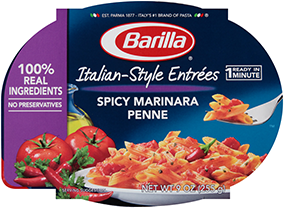 Customize it: Trade in Barilla® Tomato & Basil sauce for a burst of fresh flavor in this comfort food favorite.